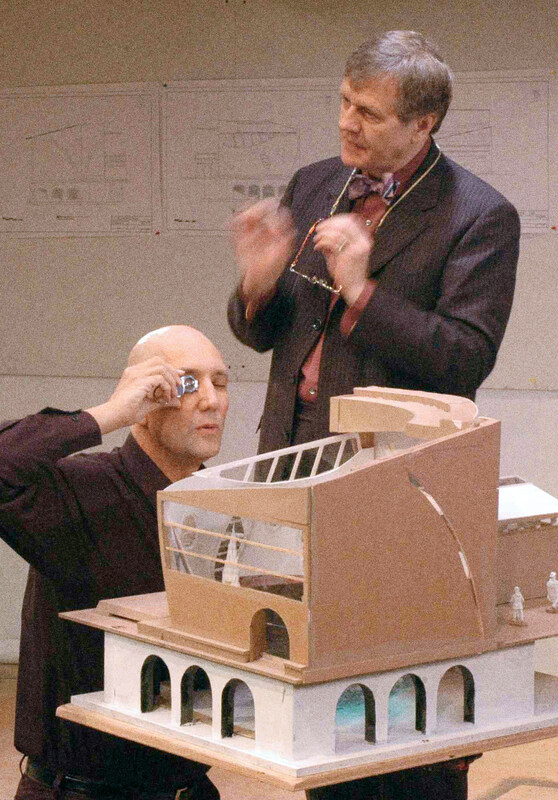 Actors Stephen Russell and Dafydd Rees in a production of Oren Safdie’s play Private Jokes, Public Places. Photo provided by Wellfleet Harbor Actor’s Theater. Actors Christy McIntosh and Sean Haberle in Oren Safdie’s play False Solution, presented at La MaMa in New York, 2013. Photo by Carol Rosegg. 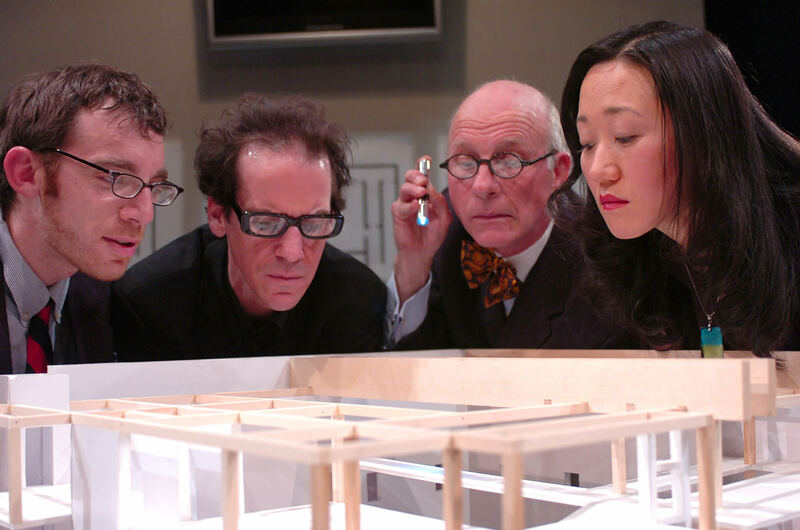 Actors Max Gordon Moore, Robert Parsons, Charles Dean and M.J. Kang in Oren Safdie’s play Private Jokes, Public Places at the Aurora Theatre in Berkeley, California, 2007. Photo by David Allen. 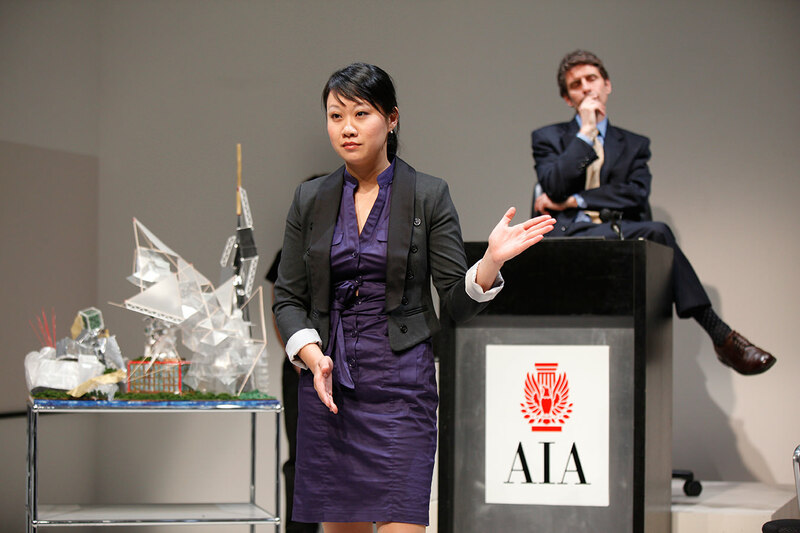 Actors Ann Hu and Marc Carver in Oren Safdie’s play The Bilbao Effect, presented at the AIA Center for Architecture in New York, 2010. Photo by Carol Rosegg. It wasn’t until Oren Safdie decided to become an architect that he discovered what he wanted to be—a playwright. The 48-year-old—who is the son of one of the most celebrated architects in the world, Moshe Safdie—was doing his master’s at Columbia University when he took a course in playwriting. It was then that the curtain came down on architecture and went up on theatre. Since then, the younger Safdie has penned 14 plays that have been performed across North America and brought him wide recognition. Though a number of his works have been set in the architectural world, Safdie makes it clear he sees the two activities at opposite ends of the creative spectrum. Though both architects and playwrights manipulate people, the former do it with light and space, the latter with plot and character. Still, Safdie has satirized architecture, both theory and practice, and had fun with the likes of Frank Gehry, Daniel Libeskind, and Rem Koolhaas. His third architectural opus, False Solution—which follows Private Jokes, Public Places and The Bilbao Effect—examines personal identity and professional vision. The drama opens in April at the Santa Monica Playhouse in California.